GREENWOOD VILLAGE, Colo., March 19, 2018 /PRNewswire/ -- The warmer weather isn't the only thing to look forward to this spring! For a limited time, now through June 24, Red Robin Gourmet Burgers and Brews (Red Robin) guests can wrangle up a Cowboy Ranch Tavern Double and The Grand Brie at restaurants nationwide. The southern-inspired Cowboy Ranch Tavern Double is a flavor-packed burger that features two fire-grilled patties, topped with bourbon-infused Whiskey River® BBQ Sauce, ranch, crispy onion straws, American cheese and lettuce on a sesame seed bun. The Grand Brie, an award-winning burger from the 2017 South Beach Wine and Food Festival making its grand entrance to Red Robin's Finest menu, features a fire-grilled, half-pound Black Angus burger with melted Brie cheese, balsamic fig jam, crispy bacon, fresh arugula and mayo on a brioche bun. "Experimenting with new flavors and pushing burger boundaries is what defines Red Robin," said Dana Benfield, senior vice president and chief marketing officer at Red Robin. "The addition of the Cowboy Ranch Tavern Double and The Grand Brie showcases our menu innovation and versatility at both ends of the spectrum, from our value-focused Tavern menu to our elevated Finest menu!" Red Robin is also elevating its popular milkshake lineup with the addition of two new, indulgent offerings. The Chocolate Hazelnut Bliss is a blend of chocolate hazelnut spread and cocoa crisps topped with velvety, chocolate whipped cream and dark chocolate Fruffles®. The Silver Spoon S'mores blends crispy, toasted mini marshmallows and graham cracker crumbs drizzled with chocolate syrup and topped with whipped cream and decadent fudge-dipped graham crackers. A new appetizer springing into Red Robin restaurants is the sweet and spicy Island Heat Wings, tender and crunchy all-white chicken wings tossed in sweet mango chili sauce, topped with seared pineapple, fresh jalapenos and minced parsley and served with Yukon kettle chips. Red Robin is also introducing a Strawberry Basil Lemonade, to pair with any of the new spring menu offerings, as well as a Strawberry Basil Margarita and White Spanish Sangria for Guests 21 and over. For more information about Red Robin's spring promo menu items or to find the nearest Red Robin restaurant, visit www.redrobin.com. 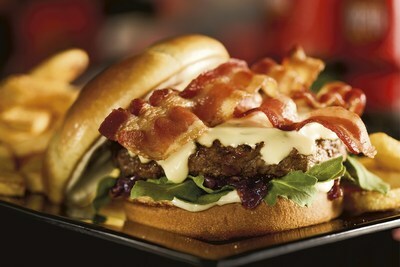 To sign up for the Red Robin Royalty™ loyalty rewards program, visit www.redrobin.com/royalty. Red Robin Gourmet Burgers, Inc. (www.redrobin.com), a casual dining restaurant chain founded in 1969 that operates through its wholly-owned subsidiary, Red Robin International, Inc., and under the trade name, Red Robin Gourmet Burgers and Brews, is the Gourmet Burger Authority™, famous for serving more than two dozen craveable, high-quality burgers with Bottomless Steak Fries® in a fun environment welcoming to guests of all ages. At Red Robin, burgers are more than just something guests eat; they're a bonding experience that brings together friends and families, kids and adults. In addition to its many burger offerings, Red Robin serves a wide variety of salads, soups, appetizers, entrees, desserts and signature beverages. Red Robin offers a variety of options behind the bar, including its extensive selection of local and regional beers, and innovative adult beer shakes and cocktails, earning the restaurant a VIBE Vista Award for Best Beer Program in a Multi-Unit Chain Restaurant. It's now easy to take Red Robin anywhere with online ordering for to-go and Gourmet Burger Bar catering pickups through Yummm2Go. There are more than 560 Red Robin restaurants across the United States and Canada, including Red Robin Express® locations and those operating under franchise agreements. 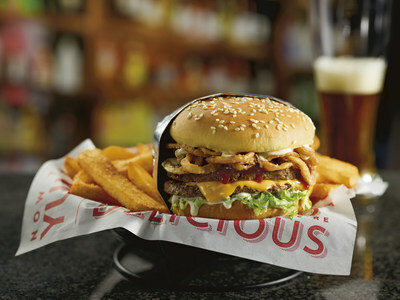 Red Robin…YUMMM®! Connect with Red Robin on Facebook, Instagram and Twitter.